We’re seriously swooning over Sarah and Zak’s wedding style. 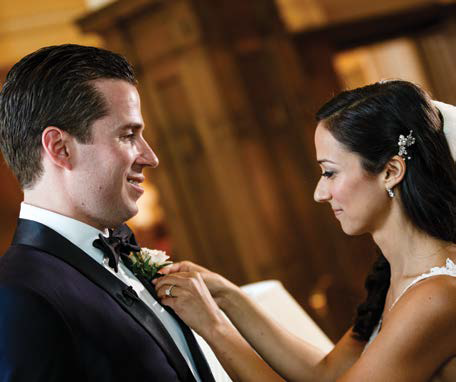 It was tough to choose, but we’ve selected five fabulous features that made their big day extra special. If you like what you see, find out how to snag their bridal look below. Sarah purchased her stunning Alvina Valenta creation from Kleinfeld Bridal in New York City. The thin delicate straps, wide open back and lace top immediately had this bride saying “yes” to the dress. 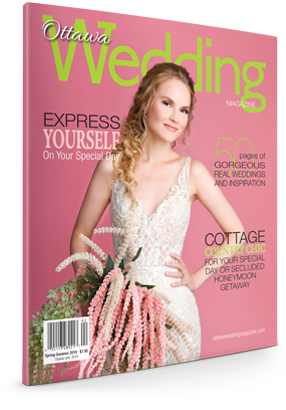 “The brand is known for its ‘effortless chic romanticism,’ which is exactly what I fell in love with the moment I tried it on.” To find your own Alvina Valenta bridal beauty, check out Ottawa’s White Satin at www.whitesatin.ca. Sarah and Zak went with a twist on tradition for their wedding guestbook. 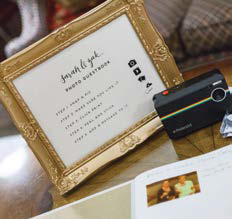 Everyone in attendance was asked to use the Polaroid Instant digital camera provided and add their pic and best wishes to a book ordered from Etsy – a one-stop online shop for all things custom, creative and sometimes even couture! For your own personal online purchases, check out www.etsy.ca and www.amazon.ca. 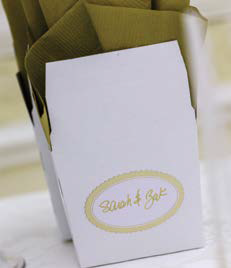 Guests received staple sweet treats upon arrival for this couple’s big day – maple syrup from Proulx Farm and a maple leaf shortbread cookie from Moulin de Provence (now affectionately called the “Obama cookie” following the U.S. president’s visit to the nation’s capital). “My grandmother had a tradition that whenever we slept over at her house, there would be a ‘bed present’ waiting for us on our beds. So we crafted notes for each guest explaining this tradition with some local treats and sightseeing ideas as their ‘bed present.’ Check out Cumberland’s Proulx Farm at www.proulxberryfarm.com and Moulin de Provence at www.moulindeprovence.com. Choosing what your girls will wear while being pampered that morning has become almost as important as the wedding gown. Sarah selected beautiful In Bloom blue robes from Saks Fifth Avenue in New York City for her bridal squad. “Getting ready with the girls was one of the fun parts of the day and the robes are a nice memory.” In Bloom by Jonquil is also available at Nordstrom. Check out the selection at shop.nordstrom.com. The options are endless when selecting your bridal accessories and a traditional veil is no longer the designated go-to to complete your look. “I knew I wanted to wear my hair pretty natural – down with loose curls swept to the side for the ceremony. My hairstylist suggested I add this accessory to make it feel more elegant and special for my wedding day.” Sarah found her beautiful hair piece from Wedding Belles New York at Nordstrom. To find your own bridal topper, check out shop.nordstrom.com.